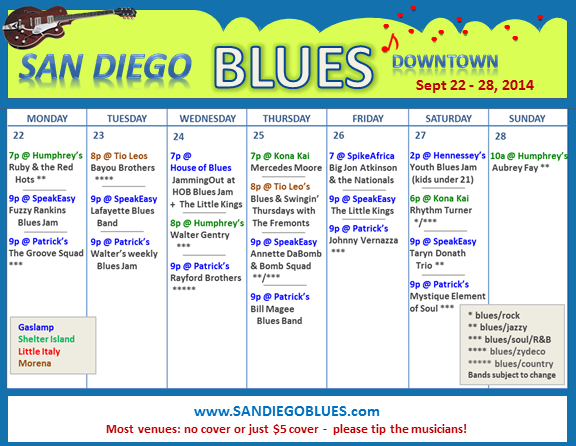 We have a great week of live San Diego blues music around town! There is a lot happening in the Gaslamp, on Shelter Island and even a night in Little Italy. Tonight we have the weekly and popular blues jam at the SpeakEasy, Walter Gentry’s R&B band at Patrick’s and a beautiful blues singer, Janice Edwards, out at Humphrey’s. What a great way to kick off the week. Enjoy!! You can find Annette DaBomb and her Bomb Squad band at the Gaslamp SpeakEasy every Thursday night. I’m a huge fan, and I got there about midnight this week and discovered John January and Chuck Arcilla had joined in as guest musicians. Here’s John on guitar playing Eric Clapton’s cover song Key to the Highway with the Bomb Squad (Tony Peterson on drums and Doug Brunell on bass), and Chuck on sax. Later Tony took the lead and sang the cover song Standing on Shaky Ground. I’ve been hearing about the Little Kings, but hadn’t heard them until this week. They were the featured band of the month (last Wednesdays of the month) at JammingOut at HOB. And they were great! They play again tonight downtown at the SpeakEasy. Here are some videos of them: The first one is a Magic Sam cover song, You Belong to Me, sung by David Mosby with his band. This second video is also of a Magic Sam cover tune, Look What You’ve Done to Me. And third is an Ike Turner cover called Rocket 88. The night wasn’t complete without jammers, and here we have Nicolas Butterfield performing a Bill Withers cover Use Me Up, which he does so well. On stage with Nick was guitarist Dave Keefer, Justin Fools on harmonica, Samuel on bass and Reggie Ford on drums. I’m happy to say we have a much fuller week of blues bands and jams downtown and out on Shelter Island. At the JammingOut at HOB, there will be a featured local blues band The Little Kings performing early in the evening, probably between 8-9pm. They are also playing again at SpeakEasy on Friday night. The Youth Blues Jam is Saturday afternoon at Hennessey’s (they have moved over from the SpeakEasy for these monthly jams). And new on the schedule is Spike Africa Fresh Fish Grill & Bar at the corner of 4th and Broadway. They have live music Friday through Sunday, and blues is part of the line up. This coming Friday you can catch Big Jon Atkinson playing there. 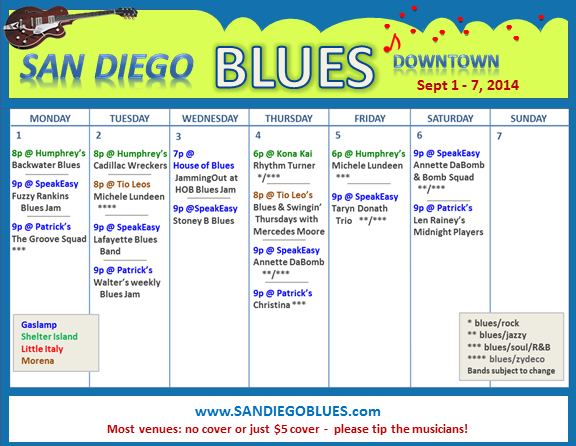 This is an unusual week for San Diego blues music. The JammingOut at HOB has been cancelled for a private event, and it is light all across town. 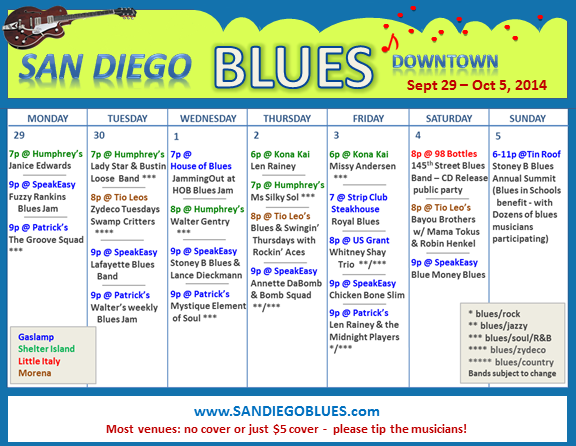 Only the SpeakEasy has a full slate of blues Monday through Saturday. One of the reasons is not enough people are coming out to hear the blues. We are losing more venues who play the blues or who are consistently booking blues bands. Save the live blues music downtown by supporting it!! JammingOut at HOB had a full house and one good set after another Wednesday night. It was a great night. Returning for a third time to the jam was Willie Simmons, who got up to perform a song I’ll call Good Woman (not sure what the song is really called), and rocked the house. He was on stage with Jacinto Castaneda and Rich Giglio on guitars, Matt Casey on drums, Earl Pratt on bass and two sax players I don’t know. In the next set, Kammie Thomas sang BB King’s cover song Thrill is Gone, with Jacinto Casteneda and Fuzzy Rankins on guitars, Kevin Cooper on bass, Reggie Ford on drums. 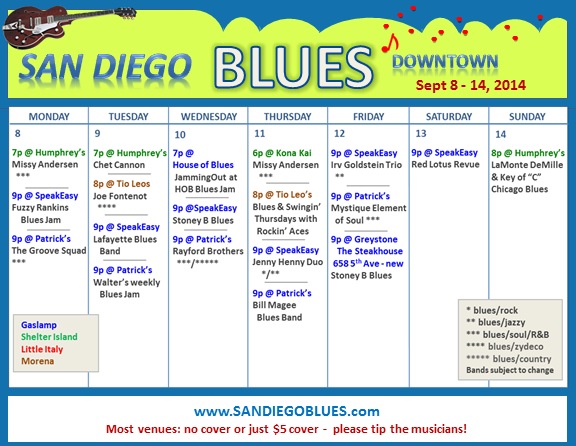 We have a nice mix of San Diego Blues bands and jams around the downtown this week every night. Greystone is a new restaurant in the Gaslamp, where Stoney B will be playing on Friday night. It is great to see another venue downtown support live music. We lost a lot of venues for blues and live music this past year, so check it out. There’s a bit of blues over on Shelter Island and some folks playing we don’t often see downtown, including Chet Cannon and LaMonte DeMille. And for those who love Missy Andersen, there are two opportunities to see her at Humphrey’s and Kona Kai. One of my favorite female blues singers is Michele Lundeen, and she performs downtown fairly often – mostly at Humphrey’s Backstage Lounge. She will be back there next week on Tuesday the 16th 7pm. I was there Friday night and got this video of her singing the cover song Some Kind of Wonderful with her band. I need to get more video of her!! She’s good and lots of fun, and she owns up to her name – the Queen of Steam. 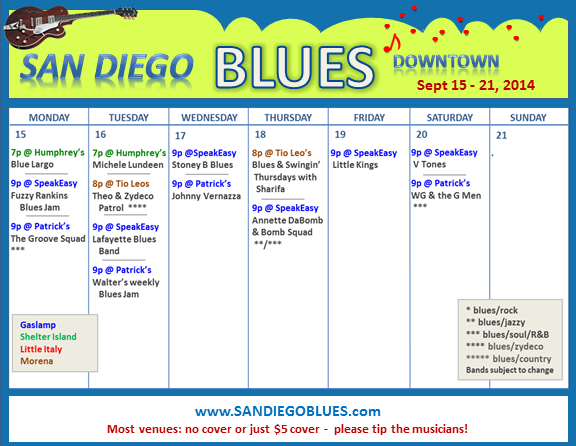 There’s a nice mix of San Diego blues this week around town, and most of it is at the Gaslamp SpeakEasy, Humphrey’s and Patrick’s Pub. The times I have on the calendar for Humphrey’s is an hour later than posted on their site, because often they start late. Some of the best blues can happen at the jams, which are on Mondays (SpeakEasy), Tuesdays (Patrick’s) and Wednesdays (House of Blues). In a month (Oct 6th), we will have the San Diego Music Awards and they include best live band (Whitney Shay has been nominated), best blues band and best blues album. Please vote for your favorite bands and musicians. You can vote every day if you want at www.sandiegomusicawards.com.